Classics is the study of ancient Greece and Rome, in particular the ancient Greek and Latin languages and literatures. Classics majors and minors study ancient Greece and Rome through direct access to the rich tradition of Greek and Latin literature in a variety of genres, and through focused study of the varied facets of classical antiquity: epic, lyric and elegiac poetry; tragedy and comedy; ancient history and philosophy; classical mythology and religion. 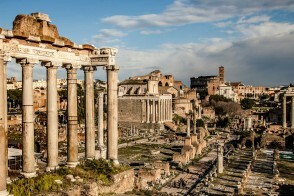 The classical tradition of Greece and Rome is the foundation of Western Civilization. Classics at Ohio Wesleyan has a long tradition that dates back to the founding of the college in 1842. Advanced courses are offered in Homer; Virgil; Aeschylus; Lucretius; Sophocles; Horace; Pindar; Tacitus, and many other great authors of the classical tradition. Also offered are surveys of Roman Republican and Imperial history and literature, of Archaic and Classical Greece and the life and career of Alexander the Great, as well as an introductory course in Classical Mythology and other lower-level topical courses in Classics. The hallmark of Classics at Ohio Wesleyan is the offering of small tutorials and independent studies on a variety of topics from the realm of classical antiquity. OWU Classics was named one of the “Best 25 Great Books Programs” in the nation by Best College Reviews. Classics students are regularly afforded the opportunity to collaborate on scholarly projects with Classics faculty and to assist in cooperative research. Classics majors often double major in another discipline. They receive a sound training in skills of critical reasoning and the rigor of close, careful analysis that makes Classics an attractive option either as a standalone major or in combination with another (especially for those interested in careers in law and medicine). Why study Classics at Ohio Wesleyan? Simply put, in Classics we do what has been done and done well for centuries: we introduce our students and majors to the wonders of classical Greek and Roman history, literature, mythology, archaeology, philosophy, language, and music. We embrace the totality of classical Greek and Roman antiquity as a noble and edifying pursuit of study, and, too, as a fine preparation for any number of vocations and career paths. The Minor in Classics consists of five (5) courses, to be drawn from courses in Classics, Greek, and Latin. At least one of these courses must be an upper level language course (e.g., Greek 330 or Latin 330), and at least one must be an upper level Classics course in translation (e.g., CLAS 310 or 322). After taking Dr. Fratantuono’s Roman Empire class my freshman year, I discovered a fascination with Roman and Greek history and mythology. Classics has played into so many aspects of my education because it has not developed just one specific set of skills, but instead it has facilitated several sets of skills that I have found useful throughout my college career. Professor Fratantuono (Ph.D., Fordham) is a specialist in Latin poetry and Roman imperial history, and in Greek imperial poetry. The author or editor of thirteen books and numerous scholarly articles and reviews, he offers courses in ancient Greek and Latin at all levels; ancient history, archaeology, and classical mythology; and directed readings and independent studies in all aspects of classical antiquity. Classics students have the ability to apply to study in Greece and Italy. The Dorothy Herbst Prize supports summer study and travel in Europe, North Africa, and the Middle East that is related to Classics and to the study of classical antiquity. OWU also hosts a vibrant series of lecturers from top Classics programs. In short, Classics majors and minors are able to engage with the rich and varied treasures of the noble traditions of the ancient Greeks and Romans that stand at the very heart of western civilization. We are a research-oriented department. Our majors in Classics are encouraged to pursue research projects and summer research travel from the start, and we have the generous resources of the Herbst and Robinson endowments to assist in these endeavors. Our students have been admitted to some of the finest graduate programs in the country; every summer we send students abroad to study classical antiquity in Europe. Our students publish papers and present the findings of their research at conferences. And every year, visiting speakers introduce our Classics students to different scholarly approaches to the discipline. Classics majors are well trained for a variety of career and lifetime pursuits, and the OWU Classics department regularly sees its graduates admitted to graduate programs in Classics. Our students have been admitted to some of the finest graduate programs in the country.